A tuxedo card is a fun presentation for an anniversary, Father's Day, wedding or just as a love note to a special man in your life. In a few minutes' time, you can make a card that's sure to make someone smile and that will save you the expense of buying a card in the store. Get crafty and put together a custom tuxedo card for your next special occasion. Download a tuxedo card template (see Resources). Cut out the pieces. Trace the jacket pieces on the black cardstock; trace the shirt pieces on white cardstock; trace the jacket folds on black velvet. Cut out all the pieces. Carefully cut a slit in the center of the collar of the white shirt. Fold the collar down to the right and left to create two folds like the open collar of a dress shirt. Fold the back of the jacket along the dotted lines. Poke holes through the dots on the white shirt with a needle. Poke miniature black brads through the holes to serve as buttons. Cut a 4-inch-long piece of 5/8-inch-wide ribbon in your color choice for the bowtie. Fold the ends of the ribbon inward so you're left with a 1 1/8-inch-long loop. Glue the ends onto the back of the ribbon to hold it in place. Wrap a thin piece of wire around the center to pinch the ribbon. Wrap a small piece of ribbon around the wire to cover and then glue it onto the back. Glue the ribbon bowtie onto the white shirt. Place the white shirt onto the back of the black jacket. Align so they match up perfectly, then glue in place. Cut a 3-inch-long piece of 1 1/2-inch-wide ribbon in the same color as you choose for the bowtie. Mark the ribbon into thirds with a fabric glue pen. Fold the ribbon over itself accordian-style to create three folds. 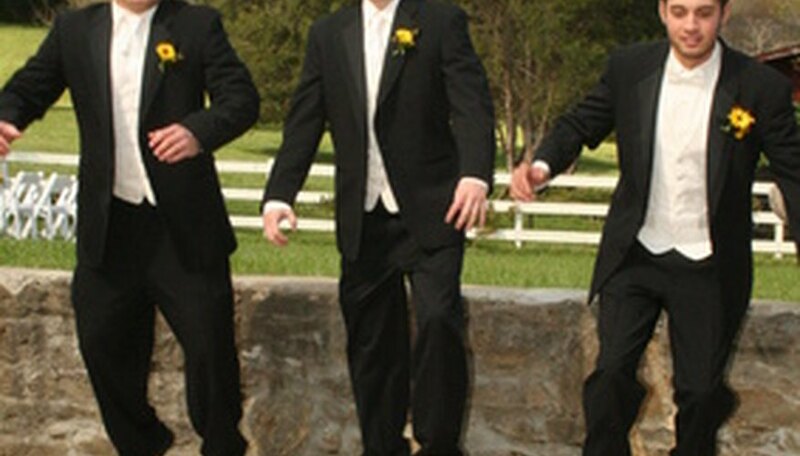 Glue the cummerbund onto the bottom of the white shirt, overlapping the white shirt and black jacket back. Glue the edges of the black sleeves to the back of the jacket. Make sure the arms open easily; if the don't, reinforce the dotted-line folds. Cut two thin pieces of white cardstock the width of the sleeves; glue onto the bottom of the sleeves. Trim as necessary. Glue the black velvet jacket lapels onto the black jacket cardstock. Poke two black brads through the front of the jacket to serve as buttons. Add a rosebud corsage sticker to the lapel of the jacket if you wish.